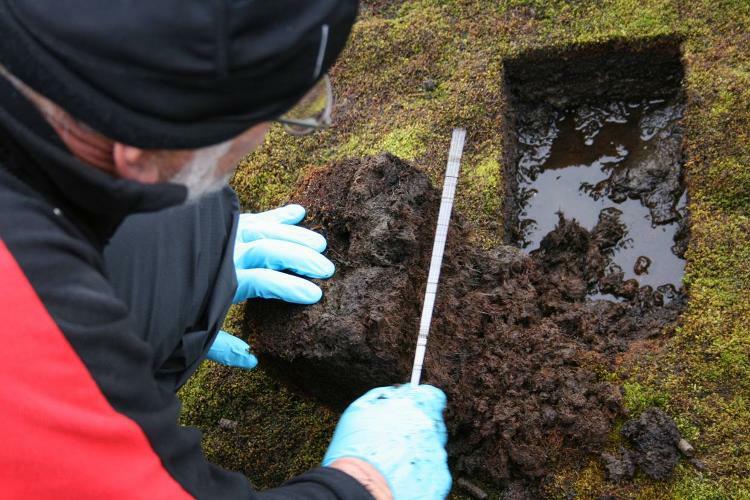 Arctic soils contain large amounts of organic material as source of greenhouse gases methane (CH4) and carbon dioxide (CO2). These are end products from decomposition of organic material and mainly from plants, which are stored in the Arctic soil. This degradation involves many different microorganisms and their activity is influenced by environmental parameters such as temperature, water content and nutrient supply. The high resolution methods metagenomics and metatranscriptomics provide direct access to the biodiversity and activity of this complex microbial society. The molecular analyses are combined with bioinformatics. Results show a community of microorganisms in Svalbard soil to some extent different from those present at southern latitudes. Arctic microorganisms have a much higher activity at low temperature, and react quickly to small increases in temperature. Both enzyme activity and production of CH4 and CO2 indicate that a given increase in temperature will cause a corresponding increase in the production of greenhouse gases. An increase in temperature also causes significant changes in the microbial community structure. Some species dominate at low temperatures while others are increasing in number as the temperature rises. These changes and temperature adjustments can have major impact on how the environment will respond in the future. The project provides new fundamental knowledge on Arctic microbial biodiversity and key features related to the turnover of stored carbon. The project has established an extensive and solid genetic database for Arctic microorganisms.